Dr. Suzanne M. Levine, D.P.M. New York City Podiatrist Dr. Suzanne Levine has been named one of America’s Top Podiatrists and is one of the most internationally acclaimed podiatrists in the industry. She has tremendous peer recognition and has been repeatedly voted one of the most influential podiatrists in the United States by her colleagues. Dr. Suzanne Levine is a highly-regarded instructor and she co-chairs the International Aesthetic Foot Society (IAFS.com). New York State, Doctor of Podiatric Medicine, #N002752-1, 1977. New Jersey, Doctor of Podiatric Medicine, #MDO-1744, 1977. New York State, Registered Physical Therapist, #004477-1. The Botox Book by Dr. Everett M. Lautin, Dr. Suzanne Levine, 2002. You Don’t Need Plastic Surgery, Dr. Everett M. Lautin MD , Dr. Suzanne Levine, DPM, M Evans Publisher, New York, 2003. Women Doctors Guide to Health and Healing, Dr. Suzanne Levine, Oxmoor House, Inc., 2003. How Top Doctors Treat Themselves by Dr. Suzanne Levine, Simon & Schuster, 2009. Your Feet Don’t Have to Hurt by Dr. Suzanne Levine, 2013. 50 Ways to Treat Foot Pain by Dr. Suzanne Levine, 2013. Walk it Off! by Dr. Suzanne Levine, 2013. My Feet Are Killing Me! by Dr. Suzanne Levine with Dr. Everett M. Lautin, M.D, 2015. Dr. Levine maintains the leading status of the forefront of podiatric surgery and keeping abreast all of the latest trends and innovations in medical treatments and non-invasive procedures. 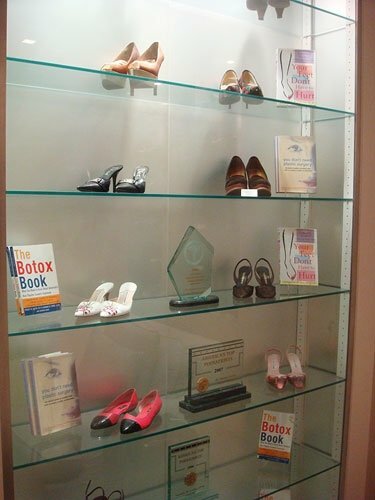 Over the past 20 years, New York City Podiatrist Dr. Suzanne Levine has authored multiple books and revolutionized podiatric surgery from her Park Avenue practice, Institute Beaute. Her ultimate mission is for every patient to feel their best and return to their favorite pair of shoes as soon as possible–even the highest of designer stilettos. Dr. Suzanne Levine is a featured regular as NBC’s foot care expert on The Today Show and WNBC’s Today in New York. Her past television credits include The Doctor Oz Show, The Doctors, 2020, Oprah, Entertainment Tonight, Extra, 20/20, The View, Nightline, Good Morning America, and numerous other premier broadcasts around the world. Dr. Levine practices podiatry at the Institute Beauté on Park Avenue in New York City. Institute Beauté also offers the latest, non-surgical medical spa treatments.